It’s appropriate that I am publishing this review today, as I watch severe weather warnings scroll across the bottom of my TV. 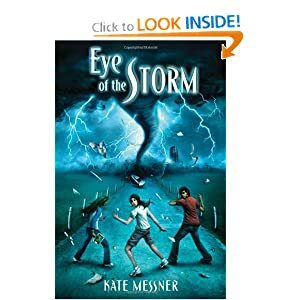 Kate Messner’s Eye of the Storm is a science novel (a term coined by Betsy Bird) about a dark future where storms have taken over the weather pattern and have pushed people out of their homes and into planned communities. I loved this novel. Anyone who reads this blog knows that I have a weak spot for the post-apocalyptic/dystopian genre. But I am also a huge science geek. I struggled to choose a major in college, because I loved biology and English. I went to a pre-engineering academy for high school. And even today, I still raise monarch butterflies and subscribe to too many science blogs to list. I was excited when I read that Kate was writing a book heavily based on meteorological science and I begged an ARC off the publicist at NCTE. Jaden’s dad is a meteorological engineer and he invites her to the middle of storm country to attend a camp for gifted and talented middle schoolers. She is happy to spend time with her father and his family and as a science geek, she looks forward to camp. But when she gets to Oklahoma, she realizes that everything is not as it seems. Her father’s planned, engineered stormsafe community seems to be going above and beyond in order to keep the residents safe from harm. But by avoiding the storms, they may be putting those outside the community in danger. 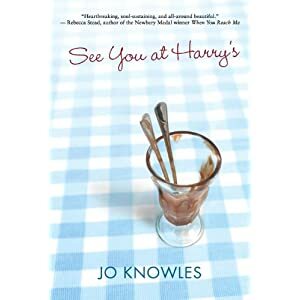 Once Jaden starts camp, she befriends some of the farm kids from outside the community and they all begin to dig a bit deeper into the storms. Eye of the Storm is recommended for middle graders, but I think it will appeal to high school readers, too. Jaden is a great heroine who is smart, geeky, and fun. The science in the book is top-notch and Messner keeps you on the edge of your seat. The teens/tweens read as real kids and as a teacher of gifted students, I recognized a lot of my own students in her characters. One warning: Be sure to have some meteorology books on hand because when kids finish this one they are going to want to read a lot about storm systems! Highly recommended for middle school and high school libraries. A great read for upper elementary students, too! 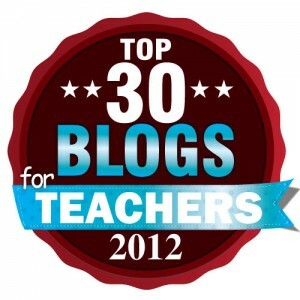 RT @spillarke: Photos from my foray into Linda Rief’s classroom http://t.co/fQyvZnn8 Wow – these are great!